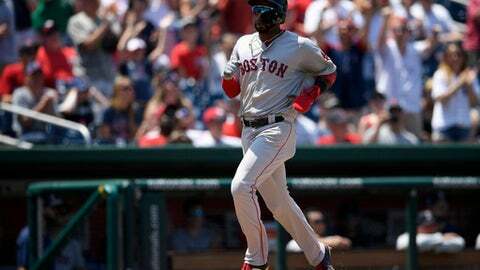 WASHINGTON (AP) Jackie Bradley Jr. drove in two runs, Eduardo Rodriguez struck out six in six innings and the Boston Red Sox beat the Washington Nationals 3-0 on Wednesday to complete a three-game sweep. TORONTO (AP) – Todd Frazier hit a two-run homer for the Mets, and Brandon Nimmo reached base three times. MILWAUKEE (AP) – Nate Orf hit a solo homer in Milwaukee’s two-run seventh after going hitless in his first seven major league at-bats. Jeremy Jeffress (6-1) picked up the win despite allowing inherited runner Brian Dozier to score from third on Jorge Polanco’s bloop single to left for a 1-all tie in the top of the seventh. SEATTLE (AP) – Kole Calhoun hit a two-run homer, helping the Angels snap the Mariners‘ eight-game winning streak. DENVER (AP) – Chris Iannetta homered in the seventh, Tyler Anderson pitched eight stellar innings and the Rockies beat the Giants for the three-game series sweep. The game lasted just 2 hours, 15 minutes – the shortest at Coors this season. KANSAS CITY, Mo. (AP) – Trevor Bauer pitched effectively into the eighth inning, and Cleveland finished a three-game sweep. The plummeting Royals have lost six straight and 18 of 21. Trevor Oaks (0-2), recalled from Triple-A Omaha to take Ian Kennedy’s spot in the rotation, allowed three runs in four innings. CINCINNATI (AP) – Starting pitcher Sal Romano dropped down a suicide squeeze during Cincinnati’s six-run fourth inning. Jesse Winker and Jose Peraza each had a two-run single during the big rally, and Scooter Gennett also singled in a run. The Reds overcame Daniel Palka’s third home run in two games to win the three-game series and complete a 4-3 homestand. MIAMI (AP) – Jose Urena and three relievers combined on a four-hitter, and Miami shook off the hangover from a 16-inning loss.